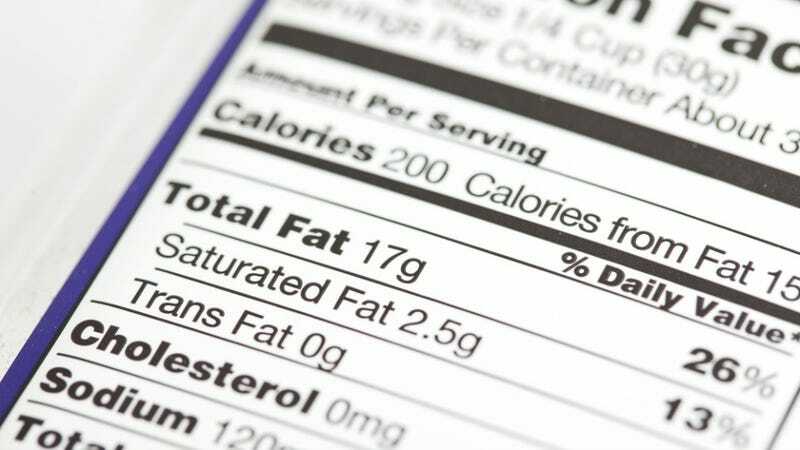 An annual survey by the Center For Disease Control and Prevention, attempting to throw off the projected 40% obesity rate in America by the next 20 years, has found that women who scrutinize the labels on the back of their food have an average BMI of 1.49 lower than women who don't examine the nutritional value of their meal. It comes out to about an 8 pound difference. For men, meanwhile, there are significantly less weight-related benefits to reading the label, only a 0.12 BMI gap. The differences don't only run along gendered lines: 49% of urban women report examining the labels, compared with a nationwide 74% rate (and 58% of men). White women showed the greatest BMI difference based on reading the nutrition labels, specifically a 1.76 gap. These findings are a little bit chicken/egg, though. They don't take genetics into consideration, or factor in the fact that the kind of women who read nutrition labels may also be supplementing their health and fitness routine with exercise. Furthermore, the US News and Health's discovery last month of a 20% margin of error on the labels themselves, allowing for a pretty wide berth of misrepresentation of calories, vitamins and other nutrients kinda puts a damper on this whole gag. Nevertheless, read the labels! Not to lose 8 pounds, but, y'know, to get a rough idea of what's going into your digestive system for sustenance.